Build Your Own Deck, part 1 (of 7) of the 10x10 deck example, will take you through the design phase of constructing a 10' x 10' deck. The design phase (the focus of this page) is where you determine the location, style, shape, and structure that will be needed to build your deck. If you already know these things, you are already well on your way to get started framing your deck. While reading through this tutorial, keep in mind that you can apply these deck ideas and building techniques to any size or shape deck project. Location is very important; there are so many design scenarios that they couldn't possibly be mentioned in this tutorial, but before you build your own deck, there are a few questions you should ask yourself. Is there a particular view that you would like to see as you drink your morning tea or coffee, or your evening cocktail. If possible, build your own deck on the south side of your home or structure. The north wind will be blocked in the winter, allowing for more warm days on your deck. The 10' x 10' deck example presented here will be shaped square, with 6x6 posts. The posts will be used for vertical support of the outer deck. The other end of the deck, the inside part, will attach to the house. There are several scenarios for attaching a deck to a house, depending on the design of the house's foundation. For this example, we'll assume the house has a concrete foundation, and the deck will be attached to it using concrete anchors. If cost is a factor, the deck surface material can be the same pressure treated lumber used for framing. Pressure treated lumber is typically less expensive than other species and is a perfectly acceptable lumber choice. If you want to build your own deck with something a little more appealing to the eye, western red cedar or redwood looks very nice and both are often specified on many wood deck plans. Cedar and redwood have some natural resistance to decay, which makes them both excellent choices for outdoor use. Tip! When designing a deck or any structure, consider the dimensions of the purchased material. In the USA, most lumber is sold in lengths of two foot increments. It makes sense to design your projects to ensure the amount of waste is minimized. Our 10' x 10' deck is a perfect example for relaying this point. For instance, if you were to build your own deck, 9 feet x 9 feet, you would still have to buy the same lengths (10') of joists and decking. The only savings might be two or three 10' 2" x 6"s that wouldn't be required. The cost savings would not outweigh the waste factor, and you would sacrifice 19 square feet of deck space! Before you plan to build your own deck, it is very helpful to create a simple drawing to help you visualize what the structure will look like and aid in estimating materials. This is good practice for all types of carpentry projects. What size joists do I need in order to span a 10' distance, if I were planning to space my joists 24 inches apart? Answer: A 10' span of a deck joist (c), without some support in the middle, requires a 2" x 8" inch (or larger) framing material (the actual size is 1 1/2" x 7 1/2"). Designing a deck frame with more joists spaced closer together will be able to carry more weight, but for the design load of this deck (40lbs / square foot), 24 inch spacing is adequate. For information on designing joist and rafter lengths based on load, see the tables on the carpentry calculators page. The thickness of the deck surface material is also another consideration for joist spacing. 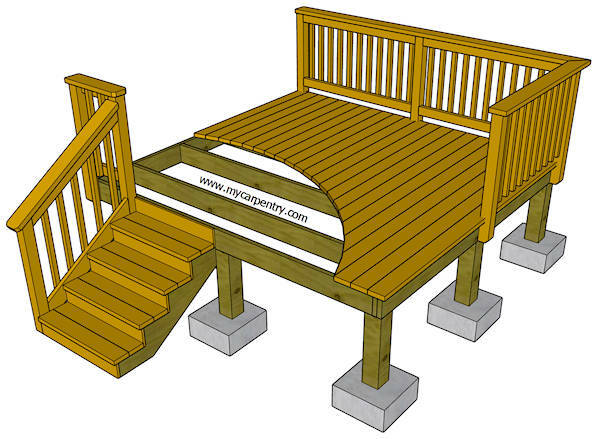 Since the 10' x 10' deck is designed with 2" x 6" inch (1 1/2" x 5 1/2") decking, the joists can be spaced 24" apart. Note: Thinner decking, like 5/4 inch (pronounced "five-quarter"), requires that the joists be spaced 16" apart. Since the 5/4" decking is only 1 1/4" thick, the joists need to be placed closer together in order to carry the weight of a person walking on it.